Actress and Writer, Stars in "Good Girls Revolt" and "House of Lies," Played Nina in the Tony-award winning "Vanya and Sonia and Masha and Spike"
Five-Time Emmy Award Winning TV Anchor & Host, "KQED Newsroom"
President, Soulbird Music, LLC / India.Arie, Inc. Racial justice, disability justice, gender justice, immigrant rights and LGBTQ rights are inextricably connected. We cannot succeed in achieving equity for one without fighting for equity for all. Participants of this session will explore how we can build a girls' movement that is inclusive, expansive and effective. As leaders and girls' champions, we are often focused on the external: actions, products and quantifiable successes. To get to these external measures of success, however, we must first focus on the internal: ourselves. This session is about holistic health and healing as central to leadership. When we, as girls' champions, recognize our trauma and focus on well-being, the girls and young women we work with do too. Participants in this session will develop personalized wellness plans, and learn a wellness planning tool that can be replicated with girls and young women. In 2015, Alliance for Girls (AFG) was the recipient of the National Girls Initiative Innovation Awards, from the US Department of Justice. This award enabled AFG to bring its coordinated community response model for improving girls' lives into the public school system. Specifically, into Oakland Unified School District. In partnership with the district, AFG implemented the Meeting Girls Needs Initiative: creating and enacting policies, practices and programs that directly respond to the expressed needs of girls of color in Oakland schools, by leveraging and organizing membership expertise and resources. Learn how you can bring the Meeting Girls Needs Initiative to your school or school system. We will use Alliance for Girls’ partnership with OUSD as a case study. Learn how to make the most of your money! This fun, interactive financial education program will help you take charge of your financial future with money skills you need for life. In Conversation with Thuy Vu, TV Anchor & Host, "KQED News Room"
This session will explore a two-tiered strategy for protecting and advancing girls' rights in the current political climate: (1) electing women into office who will fight for women and girls' issues, and (2) advocating and organizing, as citizens, for the policies that girls’ lives depend on. This session will feature campaign organizers who have successfully elected women into office at the local, state and national level, as well as advocates who have successfully passed critical policies for girls and young women. Participants in this session will leave with a step-by-step guide for how to elect women into office (with an eye toward the 2018 mid-term elections), and defend and pass pro-girl policies. Culture change precedes political change; it enables it. Art appeals to the heart first, and allows people to imagine the impossible without the constraints of the realistic. It is through art that great social movements have been born and sustained. Rosie the Riveter was a vital symbol of women’s critical role in the workforce and Bob Dylan gave voice to the frustration of a generation of young people who did not believe in America’s war in Vietnam. Participants will learn how to transform our culture from one of anger and division to one of love and solidarity -- by appealing to the heart. This live, interactive experience helps you understand how the choices you make about career and money can have a dramatic impact on your future. I am not free while any woman is unfree, even when her shackles are very different from my own." Sponsors of Alliance for Girls’ 5th Annual Conference make a difference in the lives and future of Bay Area girls while positioning themselves as visionary community leaders. If your company understands the importance of investing in girls to ensure the future vitality of the Bay Area’s workforce, become a conference sponsor. Our sponsors come from across sectors including finance, technology, telecommunications, health care, philanthropy and the food and beverage industry. Their support helps build and strengthen connections between the girl-serving sector and the business community. And, sponsors don’t just contribute financially -- they participate in the conference as well -- providing employees with an inspiring educational experience! For more information, please contact Emma Mayerson at (510) 629-9464 or emma@alliance4girls.org. 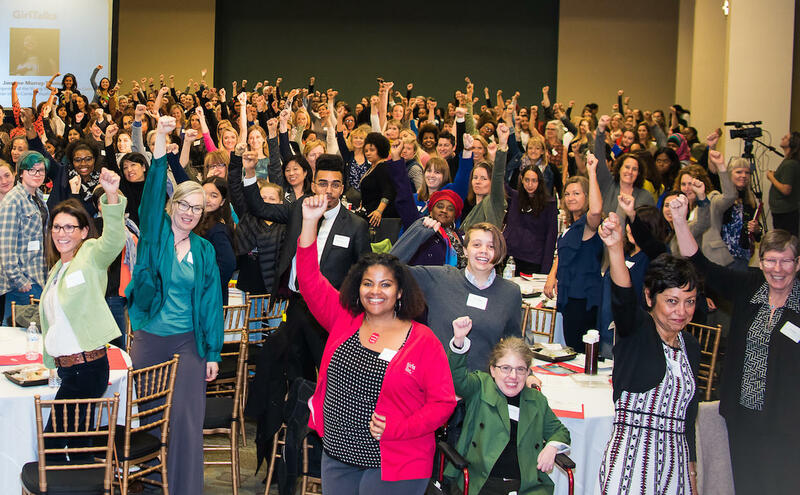 Alliance for Girls' Annual Conference convenes extraordinary, intergenerational leaders of the girls' movement. Last year, 60 girls attended the conference, for many of whom it was a life-changing experience. This year, we want to invite 100 girls to attend (for free). Help us get to 100 by sponsoring a girl ticket! Just $100 sponsors 1 ticket for a girl and $1,000 sponsors a full table for 10 girls. We will release free tickets for girls on Monday, April 3rd. To sponsor girls, click "Register Now" below and select the third ticket option. "It was so fascinating meeting such a wonderful panel of women. It was truly inspiring listening to their answers to questions in terms of issues facing young girls today." Alliance for Girls will be filming and taking photos of attendees enjoying the summit. We will also be photographing/filming summit events for promotional purposes. Alliance for Girls will not post images with identifying information such as name, email address, address, or family members’ names. If you do not agree to this, please complete this opt-out form and send it back to Kailin Chou (kailin@alliance4girls.org), along with a photo of the person opting out, which will be used as a reference for us to avoid using images of them. If you are under 18 years of age, please review the form with a parent or guardian. Check out videos of past speakers like Alicia Garza, Peggy Orenstein, Teresa Younger, and more below! Alliance for Girls' 5th Annual Conference will take place at the historic Oakland Scottish Rite Center, which is conveniently located by Lake Merritt in downtown Oakland. If you are a girl or young woman between the ages of 13 to 24, register here! For non-profits that are not members of Alliance for Girls. Registration closes at 11:59 pm (PT) on Monday, May 22nd, or when tickets sell out.